Me, Inc. – My New MUST READ For All Entrepreneurs. 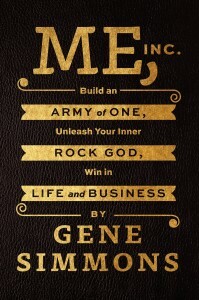 So, I just finished reading Me, Inc.: Build an Army of One, Unleash Your Inner Rock God, Win in Life and Business by Gene Simmons of KISS and I have to say that I TOTALLY loved it! Coming from a rock background, I grew up with KISS being one of the groups I admired. As an adult I got to learn more about Gene specifically and see how much of an entrepreneur he truly is. This book opened up even more to me about who he is, what he stands for and how he looks at the world. First off, I liked the layout of the book. The first half is more of an autobiography to lay the groundwork of where he came from and what he’s accomplished. I learned a lot from that section in relation to how he’s always looked at what he’s able to accomplish. My favorite lesson from reading the first half of the book is that we are all responsible for learning what we need to know in order to stay ahead of the game. When I was in the Rock business, I wanted to get into recording so I learned everything I could about the mixing boards and mics. I took a non-credit class in college just so I could learn more about the mixing process. I can say that class alone was the best use of my college experience. It was worth 10x what all the others were all together. It helped open doors to me working with Jefferson Starship and ZZ Top (my first big gigs). So many times we use the “I don’t know how to do that” excuse as to why we aren’t successful. With the Internet being what it is and Google being the all mighty knowledge base out there, you can find pretty much anything you need to know at your fingertips. “I don’t know how” isn’t a good excuse any more. You can learn how. Just ask! When I was at the Internet provider I worked for, people asked if we designed websites. At first the answer was that we didn’t know how. I saw the opportunity and took it on myself to learn HTML, then Photoshop. That brought the company a new revenue stream and ended up being the basis of me starting my first company. I took it on myself to learn how. No one suggested it. No one forced me to. No one paid for it. I did it all on my own. I paid for the books (we didn’t have video training back then), I worked on building a new site for the company on my own time. I didn’t get paid for that. No one asked me to. I just did it as I knew it’s what I needed to do to get things to the next level. When I read about Gene’s thirst for knowledge and how every aspect of the music business worked, I totally loved that. I knew I’d love the rest of the book. It’s about taking personal responsibility and being in control of your own success. Even if that means working extra hours without getting paid, without someone asking you to, without someone paying for you to get that book or extra training. It’s about YOU doing it because you know that’s what you need to go to the next level. Part Two of Me, Inc is more like a learning book like most successful entrepreneurs share… with one difference. He’s telling you what will actually work, not sugar coating any of it. For a long time, Larry Winget was the only one I read that was so brutally honest and I can say that Gene has been added to my list of favorite people along with Larry. The book is an easy read and jam packed with the things he used to create the success that is KISS and Gene Simmons. From music to film to comics to publishing, Gene’s got his hands in a lot of things and after reading this book I’ve discovered just how much knowledge he has and how smart the guy really is. Get this book and read it immediately. It’s now in my top list of recommended reads for anyone not only in business but if you’re an employee and want to get ahead in the the game, this book will give you the roadmap. It’s about working hard and never thinking someone else will hand it all to you. It’s about creating that personal responsibility we all need to strive and become better at anything we do. Business or personal.